Today's Snapchat-crazy teens are tomorrow's young voters. That's all a GOP candidate needs to know. WASHINGTON—Presidential candidates took to Snapchat, the popular photo and video-sharing app, as they celebrated the nation’s birthday. 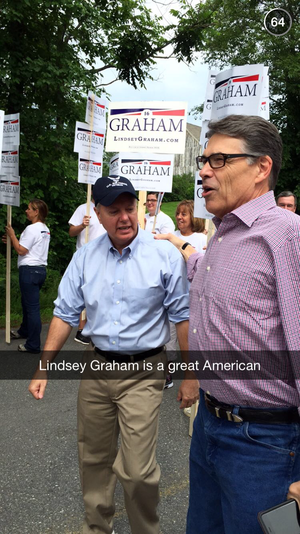 Out of the 14 GOP candidates, seven are already actively using Snapchat to boost their campaigns. Rick Perry bumps into fellow presidential hopeful Lindsey Graham at a parade in New Hampshire. Start with Texas Gov. Rick Perry. He posted candid pictures of a chance meeting with fellow presidential contender and South Carolina Sen. Lindsey Graham, along a 4th of July parade route in Amherst, New Hampshire. Meanwhile, former Maryland Gov. 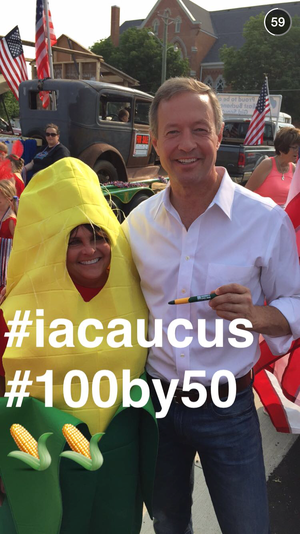 Martin O’Malley posed for the camera at the parade in Independence, Iowa, standing next to a woman dressed as a giant ear of corn. Snapchat is a photo and video-sharing service with a catch: The content you, or a would-be president, send to “friends” disappears within seconds of viewing. Since late 2013 users have been able to create “stories” or personal video montages that are available to all of their friends for viewing. The stories last for 24 hours before disappearing into the ether. Beginning with a 2011 launch, Snapchat has ballooned into a major player in social media. According to the company, its app has nearly 100 million daily active users, and over 2 billion video views occur every day on the mobile platform. 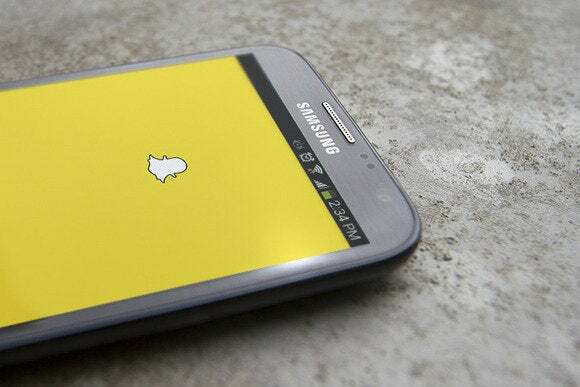 For politicians, perhaps the most important aspect of Snapchat’s demographic is that 60 percent of its users are between the ages of 13 and 34, which includes the youth demographic critical for the next presidential election. Martin O’Malley poses with a woman dressed as an ear of corn at a parade in Independence, Iowa. It was during the last two presidential elections, of course, that social media started played a big role in campaigns. President Barack Obama used the then-new Facebook and Twitter to reach younger voters. This time around, Snapchat is the place to find the nation’s youth, and the potential for social media to sway voters is understood. “At the moment 2016 Republican candidates are trying to make up from past failures in being slow to adopt social media tools, so they are all over it,” said Bianca Prade, vice president of SKDKnickerbock, a public relations and political consulting firm. Prade listed some of the candidates building the strongest social presences on Snapchat. “Many point to Jeb Bush announcing his run for president on the tool as an example. Rand Paul was even earlier than that,” said Prade. The Bush campaign worked with Snapchat to create a custom-curated feed to capture and promote his presidential announcement. For all the GOP candidates’ Snapchat efforts, they have a formidable rival in Democratic candidate Hillary Clinton. “I think the most creative use comes from Hillary Clinton, who did a wonderful job crowd sourcing photos from campaign rally attendees and then compiling them into a live story,” said Prade. 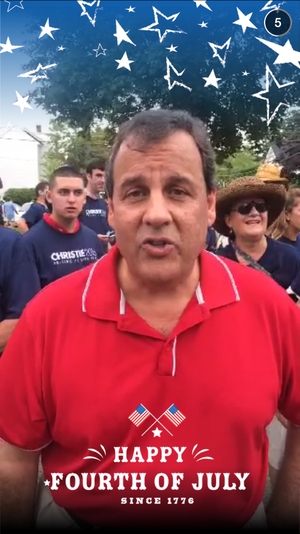 Chris Christie takes a moment to address the camera at a parade in New Hampshire. Since Christie’s campaign announcement last Tuesday, his Snapchat story has remained busy. Each day those managing his account—it can’t be Christie himself since so many of the snaps are of the governor and are not selfies—have posted over 100 seconds of content to the app. For proof of Snapchat’s power, look no further than Sen. Lindsey Graham, who apparently eschews other forms of digital communication. The Republican senator told Chuck Todd at NBC, “I don’t email. No, you can have every email I’ve ever sent. I’ve never sent one.” During the 20 years Graham has spent on the Hill, he has somehow avoided email entirely. Yet he has a Snapchat account.